The last week of The Red Mile’s Grand Circuit meet began on Thursday, Oct. 4, but we were concentrating on the last three days in Kentucky, when the bulk of the Breeders Crown-eligibles prepped for the main event this month in high-class events. Friday and Saturday and Sunday suggestions from this blog resulted in some big winners and certainly made betting at The Red Mile produce black ink for wagering accounts paying attention. Let’s go backward, beginning with Sunday, Oct. 7, Kentucky Futurity day at the Lexington oval. Both of the main events were conducted in the “heat” format, which we embrace because one can scout great overlays in the elims (first heats) that produce the final field (heat two). We were spot on with the Kentucky Filly Futurity, handing out Oasis Dream as the winner of one of the elim heats. Oasis Dream won and paid $27.60. Though we lost the second heat because our choice, Bluff (27-1) did not fire, we chose the filly based on the scenario that it was very likely Check Me Out, the queen of the division, would lose her first race since she broke in a main event on Hambletonian day. That was the premise for chosing Bluff and the premise turned into reality—just not with our horse. 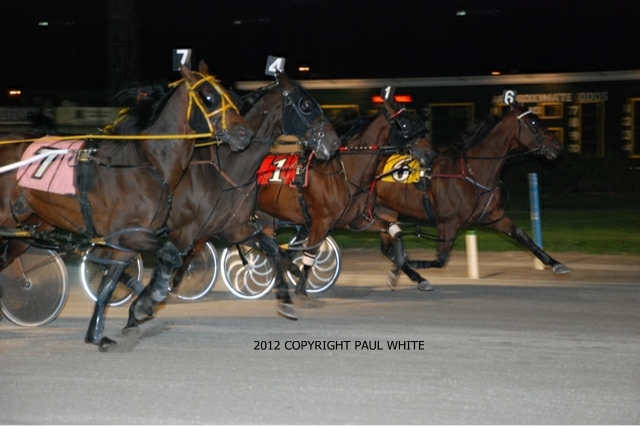 The longshot winning was Win Missy B (see photo left), paying a bit less than Bluff offered. Though we cannot take credit for the winner, if the scenario was accepted and blog followers chose a filly to upset, you can thank us for that; it was an exclusive opinion expressed nowhere else in the harness business. Then there was the main event, the colts in the Kentucky Futurity (actually open to fillies but they rarely compete). With the same elim-heat-wagering mentality we chose My MVP to win the second heat over some well bet popular members—and we won. Taking his elim heat, My MVP paid $19.60. My MVP lost all of his value in the final, though he won it, paying $6.60. These two elim-heat results (thought they did not pan out in this years Little Brown Jug) prove that this is a profit-making strategy. In the first elim heat for the boys we finished third at 9-1 with Another Amaretto, who finished third in the final at 39-1. Saturday at The Red Mile we had two fairly obvious winners. In the first International Stallion Stake (ISS) for frosh-colt pacers we won with Fool Me Once ($6.20). We stayed with popular opinion in another ISS with the monstrous pacer Captaintreacherous, who won again ($2.40). 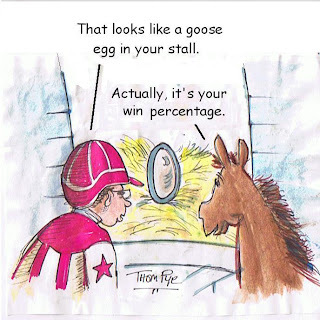 On Friday at The Red Mile a single hit made the whole program worthwhile in the profit department. 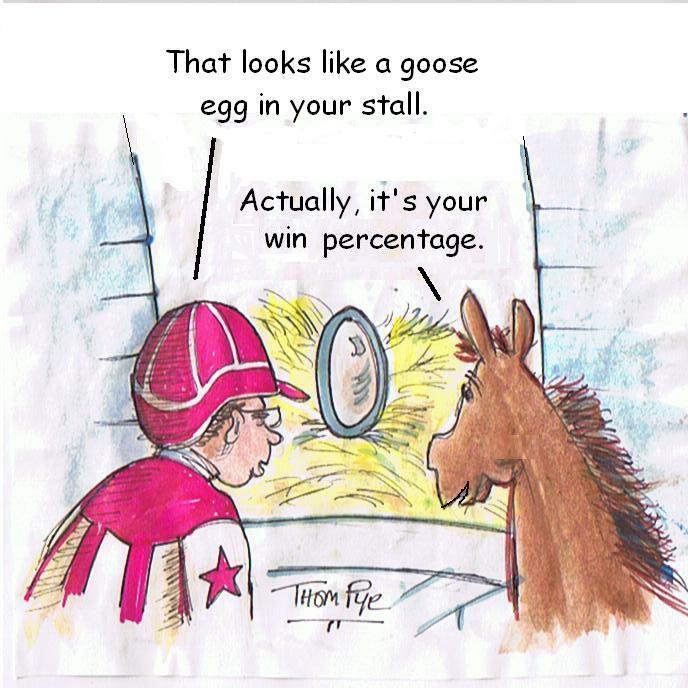 Even if you lost with six of the seven horses we suggested, you won money due to the success of Hit The Curb. The frosh-filly pacer won an ISS and paid $35.80. A footnote on Friday, though it was a loss unless you play triples and take some of our overlays into consideration, was Lauderdale. This frosh-colt trotter finished third at 93-1 and that made some exotic-wagering players very happy. In that department, also, was Broadway Prince, another frosh-colt trotter, who finished second to the fave in an ISS split at 8-1. Straight-out failure was in the mix on Friday, however, as we bombed in the Maywood stakes, when one of our horses broke at the start of the race (9-1) and never had a chance and another was fourth at 13-1. Our exclusive Breeders Crown Countdown blog continues as we head for the eliminations of the season’s divisional classics. We will be reporting live on the night of the elims and finals from Woodbine, so be ready (see below) and follow us for the top value wagers available anywhere in harness racing. Hambletonian and Canadian Trotting Classic champion Market Share was not eligible to the Kentucky Futurity but trainer Linda Toscano gave the colt a good workout by racing on Saturday, Oct. 6 in a $10,000 Late Closer at The Red Mile. The non-disputed leader of his division took a lifetime mark at 1-9, going the two turns in 1:50. Tim Tetrick was in the sulky for the $2.10 win. Market Share is poised to take on the best of his division in the Breeders Crown, with eliminations at Woodbine on Oct. 19 and Oct. 20. Also prepping for Breeders Crown eliminations, working out at Mohawk Racetrack on Oct. 5 were Daylon Magician and L Dees Lioness. 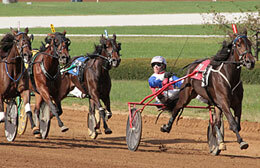 The former, a four-year-old horse trotter, won a qualifier with his usual pilot, Jack Moiseyev. Frosh filly pacer L Dees Lioness put in a tightener for trainer Casie Coleman and driver Scott Zeron, winning in 1:56. Googoo Gaagaa, the trotting son of a pacing sire who stormed through the glamour-boy trotting division this season when he met division members, qualified in 2:00.2 at Rosecroft Raceway recently but not for the big “Crown” dance. The son of Cam’s Rocket, a Maryland-based sire, cannot race in the prime events for the same reason he was unable to be in the Hambletonian, Canadian Trotting Classic and Kentucky Futurity—his pacing sire. Harrah’s Philadelphia is open again. The fall meet goes through Friday, Dec. 21, with racing Wednesdays, Thursdays, Fridays and Sundays starting at 12:40 p.m. EST. There is a special program on Nov. 3, held in league with the Breeders Cup thoroughbred series at Santa Anita. On Nov. 2 the post changes to 3:30 p.m. and racing on the Friday after U.S. Thanksgiving, Nov. 23, goes under the lights at 6:30 p.m.
Indulge in many standardbred topics at my Hoof Beats blog titled Vast Performances. Every weekend as part of that blog we we offer Balmoral Pick-4-and-win picks at the USTA’s Strategic Wagering Program page which includes suggested win bets. Last week’s Sunday ticket produced two winners, Lismaraslady ($13.80) and Classy Chassy ($11.60). This week’s Saturday ticket produced Born To Rockn Roll ($13.20).